Husky 8 gallon Air Compressor is the ideal solution for a number of nailing and inflating tasks. This 8 gallon compressor is built with a powerful 1.5HP motor to ensure reliable operation. It delivers 4 CFM at 90psi and it maximum pressure is 125psi. 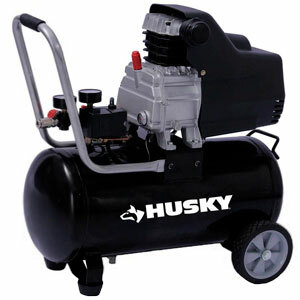 Husky 8 gal air compressor has a comfortable handle and wheels which allow easy move it to any place you need. This compressor is quieter than oil-free compressors and it features big oil sump for long life, oil-lubricated pump with a durable cast-iron cylinder and a rugged steel tank. In addition, this 8 gal air compressor has an induction motor so there’s no brushes or belts to replace which is greatly reduced maintenance and life-cycle costs. Also it has 1/4 turn condensation drain valve which provides fast draining of moisture from air tank. It takes 2 minutes to fill up from a dead start and about 30 seconds to recover when the pressure dropped to 80 psi. It comes up with a female quick-release fitting already installed. Overall we can say that this air compressor is really good for home tasks. It has good balance between quality and cost, and 8 gallon air tank will be enough for almost any home tasks. Manufacturer Warranty – 2 year limited. It does require oil for running as its not oil-less. There’s an oil sight gauge on the side of the pump. You should keep the oil level in the center of the red dot all the time. If your air compressor won’t start in cold weather, you should try to use special oil which rated for low temperature. Assembly was a little bit of a pain because it has hex screws which screwed into a bushing mounted in the handle. If you look back there you can see the bushing. The bushings were loose so I had to get behind that area with the pliers to hold them down. These screw threads are really tight. I recommend you screw them into the handle before it’s managed to get the threads loosened up. Also put some oil on the handle screws before you screw the handle on. Overall it looks to be well made I’m hoping it’ll last a long. If you want to write a Review about this product, please use the form below.